A Trappist lager inspired by German tradition! Smooth, russet colored, hearty and malt-forward, hints of smoke and spice. Balanced by noble hops and a bitter finish. I am doing this review with only one bottle for me it should at least three beers. a burnt orange amber color small head and not a lot of lace. aromas are faint but sweet and fruity. smooth and very tasty malt body and at 7.5 abv you would not know it. want to try more and see what other beers spencer offers. we do have some very good brewers in ma..
From the bottle, it pours a solid darker amber with a modest, though long lasting, head. Some lacing as you enjoy the beer. Malt in both the nose and mouth. 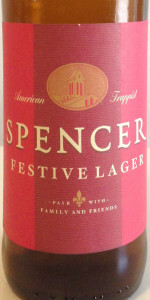 As a "Festive Lager", some think of this as a fest bier type, but I disagree. I see it (and rate it) more as a bock (or a double bock due to alcohol level) instead, due to the high alcohol and malt forward flavor. L: Pretty standard, burnt orange in color, with bright orange highlights around the glass. Off-white head, decent retention. S: Very sweet, standard aromas in there, light caramel, biscuits, honey, and toast. Also a pretty strong dark fruit aroma, fig or apricot. Almost raisin like. T: Feel like dark fruit sort of dominates the palate here. Has a sort of syrup like sweetness. Not really getting much in terms of the standard flavors of a marzen. Also finishes quite bitter. Not crazy like a WCIPA but noticeably more than what I am used to for the style. F: Heavy for a lager, cloying, and dry. Sort of lacks balance and drinkability. O: Not bad, just sort of misses the mark. The dark fruit wasn't necessarily a negative just very uncharacteristic for the style. If you approached this beer as you would a quad or something like that, it might seem better, but it is labeled as a marzen and doesn't drink like one. Drinks boozy for an Oktoberfest, with an amplified fruitiness and some light caramelization. Helles malts, Munich malts, amber malts, maybe even crystal malts. The high ABV (relative to style) is noticeable, to its detriment. Too sweet, but nevertheless enjoyable in limited quantities. Has that sweet treacly bend to it, but it's tolerable drinking one bottle in a sitting. Heavy on the Munich/caraMunich, with a floral hop presence that's mild at best. Amber malts, Belgian candied malt, vague fruitiness, syrupy sweetness. I don't know what's meant to be Trappist about this (it's clearly a German style Oktoberfest) but then Spencer does seem to be a gimmick of a brewery trading on the Trappist designation without actually delivering in terms of tradition and/or style. It's competent drinkable fare at best, and I wouldn't want another 6 pack (or another bottle in the same night). Lacks the balance and depth of flavour of the best expressions of the style. And why the ABV is so high is beyond me; it's really unnecessary and doesn't help the beer at all. I think my favourite aspect of the beer is the sleek label design. Pours a lighter fizzy head covering that disappears fairly quickly, no real lacing, slight hazy tan slight amber colored beer. Nose displays what I was afraid of, sweet candy malt, little syrupy, caramel, little biscuity Belgian candy malt, plenty of reddish malt, faint faint grassy hop. Taste brings more sweet syrupy malt flavors, biscuity, toasted grainy, big caramel and candy syrup, little fruity apple syrup, then herbal grassy hop bitterness that clashes with with syrupy malt mess, an icky smoked malt, and mild bitter spices. Finish drier but little syrupy, candy syrup sugar malt mess. Mouth is med bod syrupy, lighter carb too. Overall a mess, nothing good really, tons of sugary sweet syrupy malt, no real lagering characters, herbal grassy hops clash with the malts, not very drinkable, not anywhere close to a festbier. A: Clear reddish pour with a substantial tan head. Nice head retention but pretty sparse on the lacing. S: Caramel and a little bit of indistinct herbal spices. T: Caramel and sweet bready malt mixed with...smoke? Touch of herbal hops. Interesting. Definitely smoke on the back end. Finish is quite dry with a touch of herbal hops and smoke. O: Not a bad oktoberfest, the smokiness is unique and luckily doesn't overpower. Not sure it contributes either. Interesting. Pours amber red with a creamy frothy khaki colored foam head. Smells like rich toasty brown bread, red apple skin, red grape, pear, spice, mild smoke, biscuits, toffee caramel malts, molasses, brown sugar, with fresh floral earthy herbal grassy pine. Tastes very rich and malty with a nice hop balance. Some toasty brown bread and rich amber toffee caramel malts, some molasses, brown sugar, toasted biscuits, mild smoke, spice, red grape, apple skin, pear, with fresh floral earthy herbal grassy pine. Feels medium-light bodied, smooth and creamy with moderate low carbonation. Overall a real nice and unique festive lager.